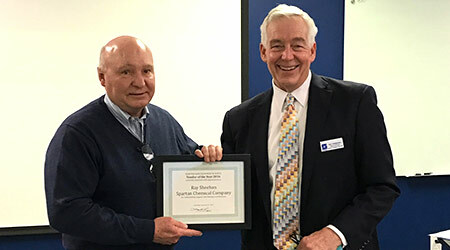 Spartan Chemical Company, a leader in the formulation and manufacture of sustainable cleaning and sanitation solutions for the industrial and institutional market, announced Ray Sheehan, regional manager, Spartan Chemical Company was named the Olmsted-Kirk 2016 Vendor Representative of the Year. Olmsted-Kirk’s Vendor Representative of the Year award is chosen based on many factors such as, prompt response time, a positive influence in the generation of new business, working with customers and sales representatives on training and problem solving, as well as evident integrity and professionalism of their company, and that of Olmsted-Kirk. The award was presented to Ray Sheehan by, Larry Lacy, during Olmsted-Kirk’s General Sales Meeting in Dallas, Texas.